Try out even more songs in trial mode. Added Dutch language support and fixed 17 bugs! Keyboards can be connected using USB On-The-Go cables. Synthesia 9 lets more people play than ever! Multiple languages! Choose between English, Spanish, French, German, Russian, Brazilian Portuguese, and Traditional Chinese. Change Synthesia's window size anytime you like. Press Alt-Enter to toggle full-screen mode on any monitor. Support for the new Synthesia Music Store. Synthesia 8.6 gets things ready for the upcoming song store. Lots of new metadata support for the upcoming song store. Add your own background image using the configuration tool. Click the score box to hide it. The "Scale Number" label mode is back. Over a dozen more bug fixes and improvements. Synthesia 8.5 is a small release containing 21 bug fixes and an easier way to enter unlock keys. There are too many improvements to list! Every single screen has been overhauled with new or improved features everywhere. It's a natural fit. Put your iPad right on your keyboard's music stand. Synthesia for iPad makes no compromises: every feature you love on the desktop has made the transition smoothly. Connect your keyboard or play using the touchscreen. The menus aren't the only thing that have been improved. The keyboard and falling notes have never looked this good before. The new graphics have been accurately modeled from a real piano. Pan left or right by dragging in the falling note area. Zoom in or out smoothly by pinching on the iPad or using the zoom menu on the desktop. Not ready for so much change? Head over to the Color Themes section under Settings and switch over to the "Synthesia Classic" theme. You can make your own themes, too. Check out the new modding forum for details. Then share your color theme with others. Multiple input/output device support, smooth-scrolling song library, user profile statistics, song library auto-grouping by folder, lots of new options, helpful prompts throughout all the menus, redesigned advanced song settings, and the list keeps going! Do you create your own songs to share with others using Synthesia? In just a few minutes you'll be able to add extended metadata, include finger hints, enable the simple song view, create links on your site that will open Synthesia in a single click, and more! The new song progress tracking feature is Synthesia's best feature ever. Grab Synthesia 0.8.3 now to get it along with a dozen or so new features. Let Synthesia guide you through the process of learning every song. The new song progress metric lets you to set personal goals and watch them become realized. Whenever you play a song, you have a chance at proving how far you've progressed in that song. This is my new personal favorite feature. Synthesia 0.8.3 brings a new, cleaner play screen. All of the clutter has been tucked into a menu at the top of the screen. With fewer distractions and a display much friendlier to lower-resolution screens, it's just you and your music. After you run Synthesia 0.8.3 for the first time, you are ready to launch songs in a single click. Try it out: Bach Chorale. Want to create your own Synthesia links for your website or YouTube videos? Use the Synthesia Song Link Generator tool. Try out the new exercises by Ash from the forums. Each exercise is split into separate hands and includes finger hints. You'll find them in the song library under "Ash's Exercises". With keyboard navigation, huge improvements to the sheet display, and dozens of quality of life improvements, Synthesia 0.8.2 is the biggest release ever. Customize all song controls. Fast-forward and rewind with your pitch bend wheel. Pause the song with your lowest note. Change the speed with your modulation wheel. Follow along smoother than ever with new note and measure highlighting. Never lose your place with an easier to follow page-turn effect. Synthesia's sheet music now supports key signatures, time signatures, staccato notes, crowded notes, better clef detection, smarter spacing, crisper staff and bar lines, and still more. Keyboard settings are remembered much smarter between sessions. Windowed mode on the Mac along with a better Mac install experience. Automatically pause when a keyboard connection is lost. Dozens of other tweaks and fixes. Finger hints included for all 100+ built-in songs. Simplified track settings let you jump in fast. Improved library searching to find your favorite songs quicker. Many improvements in MIDI, device, and computer compatibility. Tons of tweaks and fixes. Strictly Come Dancing is the original UK version of Dancing with the Stars. Each year the show puts the trainers through a crazy challenge. 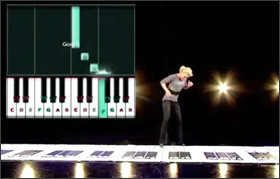 This season, Synthesia's falling note display was combined with a giant floor piano in the "ITT Grand Piano Challenge". They kind of threw them to the wolves by only giving the trainers one attempt and not letting them practice ahead of time. Check out the final two performances and award ceremony from the show. Named profiles. See your name next to your scores after playing locally or online. Compete against friends. Many settings can now be changed during gameplay. A handful of fixes and other tweaks. Revamped track settings saves time with copy and paste settings. Better song library performance, especially with big collections. This month we have a few things I've wanted to include forever now. 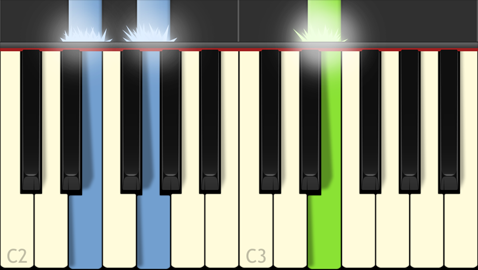 Lighted keyboard support: the next note will light up while stopped in practice mode. Turn it on via the Keyboard Setup screen. Improved note labels: new mode, more accurate, and easier to read. New configuration tool with windowed mode and resolution picker. Improved looping: easier to use, easier to find, better feedback. A number of stability and other bug fixes. The long-awaited metronome is available at last. Lots of other great engine work made it in to prepare for the upcoming online scoreboard. Metronome. Control the speed, volume, and style. Works with simple, compound, and even changing time signatures. Have fun with instruments. Click a track's instrument icon to change. Find songs faster. Search with the new song library filter box. Create quick loops between bookmarks using the < and > keys. Speed improvements. Gameplay now runs smoother than ever. Synthesia is moving full-speed ahead now. This is the first of six monthly releases that will run until the end of the year. Check out what's new below, download the new version, and enjoy! Song looping: Create loops with one click to keep practicing those tough parts. Statistics are shown in real time detailing how you are improving. Synthesia is now aware of smaller keyboards. Set your size on the keyboard screen and Synthesia will play notes outside your reach or move them closer so you can play them yourself. Scoring revamp: hold notes for their full duration for maximum points! Lots of other improvements and fixes. It's ready. This is an exciting time for the project. The 0.7.1 release is a great stepping-stone to the newly accelerated development schedule I've just started. Expect to see releases with more, released more often from here on out for the next six months! In the meantime, check out what's new below, download the new version from the box on the left, and enjoy! 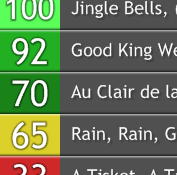 Song Bookmarks: place markers that let you jump right to those tough sections. New play screen navigation: click the timeline to jump, the buttons to navigate, or the mouse-wheel while paused to scroll the song. Your keyboard's sustain pedal will now hold the duration of notes. Sheet music improvement: notes are much smarter about which staff to appear on. Improved song library searching: type a song name to jump right there. Better error reporting: crash report files help me jump right to the problem. Tons of other improvements and bug fixes. I am proud to present the 0.7.0 release of Synthesia. Check out the feature list, download the new version from the box on the left, and enjoy! New Song Library with audio previews and sorting by difficulty and rating. Scoring for practice mode: now you can follow your progress. Sheet music display improvements including rests and a fixed-width option. An option to require all notes in a chord be pressed at the same time in practice mode. Keyboard setup screen to help diagnose connection problems. Lots of menus re-worked to make navigation easier and more intuitive. New "View in Synthesia" right-click shortcut: a quick MIDI viewer. Tons of other improvements, fixes, and optimizations! It's that time again. Here is the new 0.6.5 release of the game. There is lots of new stuff to check out, so download the new version from the box on the left and enjoy! Note and key labels (C, C#, D or Do, Re, Mi). 120+ new songs included from G Major Music Theory. The usual assortment of bug fixes and improvements. I am very pleased to present both the new 0.6.4 release of Synthesia. Download the game from the box on the left and enjoy! Practice mode that waits for the correct notes. Sheet music display with two display styles. Measure lines in the falling notes. Play-settings screen that gives more control over gameplay. Several new options to tweak the display and a handful of bug fixes. Zoom to song or 'You Play' extents so notes are easier to follow. Option screen that allows some tweaking, most-important: play all user input. Lots of bug fixes, new DirectX back-end to correct some issues. This one is smaller than expected because the holidays were busier than I had hoped. Rewind / fast-forward during songs. Top scores list for each song you play. Song and track settings are saved between plays. A software keyboard so everyone can try it out. Auto-splitting single-track MIDI songs to have one track per instrument. Zoom to your keyboard or song extents. Tons of new built-in music and warm-up exercises. Lots of display and game customization via new options screen. External devices can now be selected for output in the Mac version. The Mac version behaves much nicer now (after about a dozen bug fixes). A couple Windows bugs were fixed. It's here! Download either the Windows or the new Mac version of Synthesia 0.6.0 to get improved graphics and performance. I have received a cease and desist letter from Activision for the use of the name "Piano Hero". See the cease and desist page for details. Quick summary: Choose a new name for the project and update the website/game. The 0.6.0 release (introducing Mac support) has been pushed back a week to April-30 to compensate. Name Suggestions: 430 names (68 duplicates) with 6 images. Check out the complete list. Winning Name: "Synthesia", suggested by Daniel Lawrence from England. It's an incredible name, thanks again Daniel! MIDI input now plays back in the correct instrument, feedback and stats have been improved, there are now tooltips on each menu control, lots of bug fixes, a new installer, and a set of 10 fantastic songs from Game Music Themes! What are you waiting for? Want a Mac version of Synthesia? Alright. You guys are awesome. The response from just a couple of articles has been absolutely unbelievable and in a single day you donated more than enough for a Mac mini. So much, in fact, that I can get an iMac instead. You guys are really incredible, thank you! You will get your Mac version as promised! Synthesia 0.5.0 Released! MIDI input is now supported. Try to get the highest score and earn the best grade. Download Now! Want to learn how to play the piano? Synthesia is a fun way to play any kind of music including your favorite video game music, classical music, and holiday music. Check out the feature list, screenshots, and then download it. Practice left or right hand parts separately. Slow songs down while learning new parts. Real piano is required - no "software" keyboard is provided. MIDI input not supported yet - just play along for now. Without MIDI input, grading or scoring isn't possible.